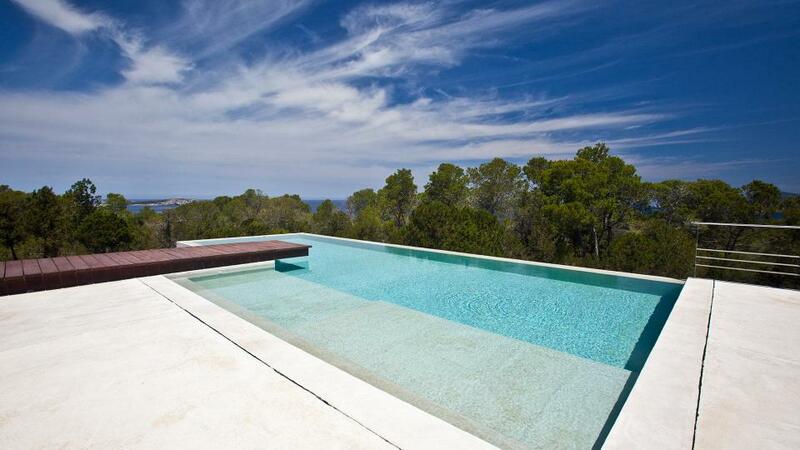 The villa of 500m2 has an Ibizenca style. The fenced plot has 2.735m2 and is in a calm environment with amazing views towards the sea. It is possible to walk to Cala Salada beach, which is less than 2km away. There is a great pine tree forest around the villa. Room, Ground level. This bedroom has 1 double bed. Bathroom ensuite, With shower. WC in the bathroom. This bedroom includes also air conditioning. Room, Ground level. This bedroom has 2 twin beds. Bathroom outside the room. WC in the bathroom. This bedroom includes also air conditioning. Room, Ground level. This bedroom has 2 twin beds. Bathroom ensuite, With shower. WC in the bathroom. This bedroom includes also air conditioning. Living room with fireplace and sofas with direct access to the frontal terrace with great views to the sea. Fully equipped kitchen with: gas kitchen, smoke extractor, electric oven, microwave, dishwasher, refrigerator + freezer (double door), juice maker, 2 filter coffee machines, toaster, kettle, laundry room located in the kitchen with laundry machine and dryer. Living room with TV with 3single beds (0.90m x 2m). Small kitchen with refrigerator, laundry room with laundry machine and dryer, coffee machine. Swimming pool 10m x 4m (rectangular shape). 8 sunbeds and one Balinese bed (2-3 guests). Outdoor dinning room with porch. Amazing views towards the sea and table and benches for 12 guests. Exterior kitchen with induction hobs, refrigerator, dishwasher, and bar. Uncovered parking for 4 cars and another parking at a lower level. The village of San Antonio, where there are all kinds of shops and restaurants is less than 4km away. Cala Gració: 7min away by car. Cala Gracioneta: 7 min away by car. The restaurants are less than 1km away from the villa. Ibiza city: 20min away by car. Ibiza airport: 20 min away by car.